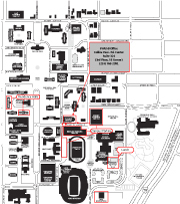 This black and white map of the campus identifies major buildings and is suitable for printing on most printers. SMU is located in the city of University Park, north of Mockingbird Lane and between North Central Expressway and Hillcrest Avenue. The SWGSB offices are located in the Collins Executive Education Center in Suite 324 of the Edwin L. Cox School of Business complex. The actual physical address is 3150 Binkley Avenue, Dallas, TX 75205. Please note the specific parking directions that follow the general directions below. For exact directions to SMU, you may wish to use an online map service, such as Mapquest, or Google Maps, and enter the exact address for the Collins Center (3150 Binkley Ave., Dallas TX 75205). The Binkley Parking Garage is right across the street. Traveling from the north, exit Lovers Lane/University Blvd. Go through Lovers Lane and University Boulevard intersections. Turn right on SMU Boulevard. Go through Dublin Street, and turn left on Airline Road. Then turn right on Binkley Avenue. A parking garage will be on the left. Once parked, exit the garage on the north side towards the Collins Center. SWGSB is located on the 3rd floor in the southeast corner (suite 324). Traveling from the south, exit Mockingbird Lane or SMU Boulevard. Go through the Mockingbird intersection and turn left onto SMU Boulevard. Go through Dublin Street, and turn left on Airline Road. Then turn right on Binkley Ave. A parking garage will be on the left. Once parked, exit the garage on the north side towards the Collins Center. SWGSB is located on the 3rd floor in the southeast corner (suite 324). Traveling from the north, turn east (left) on Daniel Avenue, which curves and becomes Airline Road. Continue on Airline, and go through the SMU Boulevard intersection. Turn right on Binkley Avenue and the parking garage will be on the left. Once parked, exit the garage on the north side towards the Collins Center. SWGSB is located on the 3rdfloor in the southeast corner (suite 324). Traveling from the south, turn east (right) on Mockingbird Lane and north (left) on Bishop Boulevard. Once on campus proceed north on Bishop Boulevard to Binkley Avenue. Turn right on Binkley Avenue. Go past the first stop sign, which is Ownby Drive, and the parking garage will be on the right. Once parked, exit the garage on the north side towards the Collins Center. SWGSB is located on the 3rd floor in the southeast corner (suite 324). Exit Mockingbird Lane and proceed east past Hillcrest Avenue to Bishop Boulevard and turn left. Once on campus proceed north on Bishop Boulevard to Binkley Avenue. Turn right on Binkley Avenue. Go past the first stop sign, which is Ownby Drive, and the parking garage will be on the right. A parking garage will be on your right. Once parked, exit the garage on the north side towards the Collins Center. SWGSB is located on the 3rd floor in the southeast corner (suite 324). Go south on I-35 E to I-635 (LBJ Freeway) and east to U.S. 75 (Central Expressway). Go south on Central Expressway and exit Lovers Lane/University Blvd. Go through Lovers Lane and University Boulevard intersections. Turn right on SMU Boulevard. Go through Dublin Street, and turn left on Airline Road. Then turn right on Binkley Avenue. A parking garage will be on the left. Once parked, exit the garage on the north side towards the Collins Center. SWGSB is located on the 3rd floor in the southeast corner (suite 324). Go north on I-35 to I-30 and east to U.S. 75 (Central Expressway). Go north on U.S. 75 (sign indicates "Sherman"). Exit Mockingbird Lane or SMU Boulevard. Go through the Mockingbird intersection and turn left onto SMU Boulevard. Go through Dublin Street, and turn left on Airline Road. Then turn right on Binkley Avenue. A parking garage will be on the left. Once parked, exit the garage on the north side towards the Collins Center. SWGSB is located on the 3rd floor in the southeast corner (suite 324). Go north on U.S. 75 (Central Expressway). Exit Mockingbird Lane or SMU Boulevard. Go through the Mockingbird intersection and turn left onto SMU Boulevard. Go through Dublin Street, and turn left on Airline Road. Then turn right on Binkley Avenue. A parking garage will be on the left. Once parked, exit the garage on the north side towardsthe Collins Center. SWGSB is located on the 3rd floor in the southeast corner (suite 324). Take the North Exit from the airport to I-635 (LBJ Freeway). Go east on I-635 to the Dallas North Tollway. Go south on the Tollway and exit Mockingbird Lane. Proceed east past Hillcrest Avenue to Bishop Boulevard and turn left. Once on campus proceed north on Bishop Boulevard to Binkley Avenue. Turn right on Binkley Avenue. Go past the first stop sign, which is Ownby Drive, and the parking garage will be on the right. Once parked, exit the garage on the north side towards the Collins Center. SWGSB is located on the 3rdfloor in the southeast corner (suite 324). Exit from the airport to Mockingbird Lane. Proceed east past Hillcrest Avenue to Bishop Boulevard and turn left. Once on campus proceed north on Bishop Boulevard to Binkley Avenue. Turn right on Binkley Avenue. Go past the first stop sign, which is Ownby Drive, and the parking garage will be on the right. Once parked, exit the garage on the north side towards the Collins Center. SWGSB is located on the 3rd floor in the southeast corner (suite 324).